Wright training sparked a prosperous modeling career for Tyler. He did work for Under Armour and moved to New York where life without lifting proved too much to handle. I grew up in Roanoke, Virginia, and currently live in Nashville, Tennessee, working as a personal trainer. Basketball was my primary focus throughout middle and high school, but I hated lifting weights. I skipped lots of sets and had a lackluster approach to the weight room during basketball training sessions because I hated pain. After graduation, everyone went to the beach for a week. My friend Justin built a pretty good physique at age 17 and inspired me to try when I returned from the beach. At age 18, I weighed 175 pounds at 6-foot-3, so my goal was to get huge. I started weight training in my parent's basement and read bodybuilding magazines to learn as much as I could. I became addicted to the pump and fell in love with training. When my body started changing, I became obsessed and hungry for more. After a solid year of training in the basement, I had the courage to join a gym, but I didn't realize how important nutrition was. My appetite was low, so I force-fed myself during the first few years. 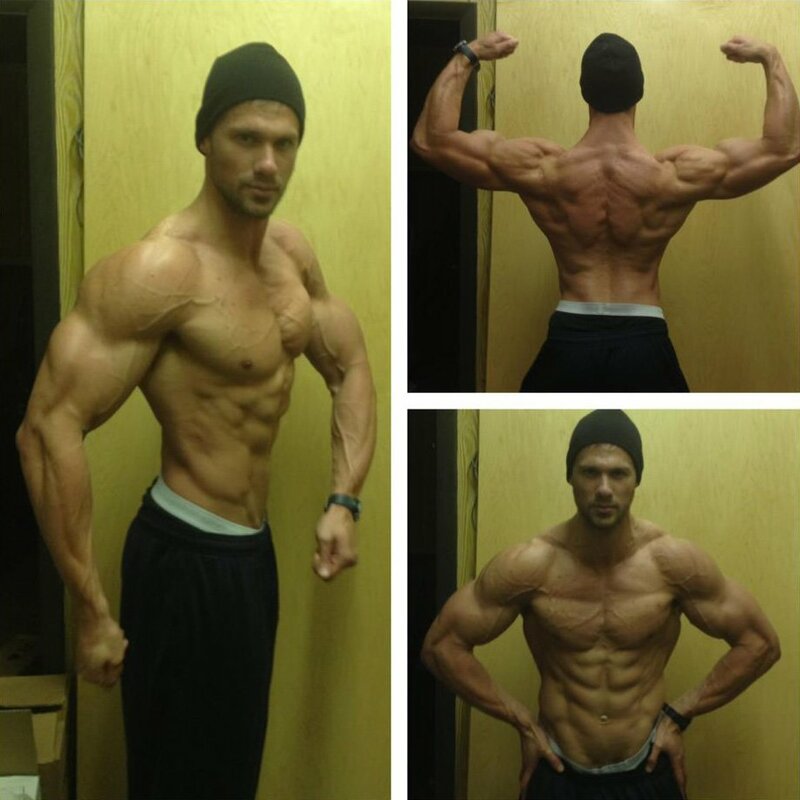 At age 21, I decided to give back through my knowledge and become a personal trainer. I weighed 255 pounds at the time and had a huge appetite. It wasn't a good 255 pounds because I was on a "see food" diet where I ate anything in sight. My daily food choices were pizza, burgers, and more burgers. I always was interested in competing, but my height ruled out the bodybuilding stage. In 2007, I decided to compete at Universe Weekend in Miami, Florida, in the fitness modeling division and cut down from 255 to 215 pounds. I didn't know much about nutrition or how to implement cardio, so I wasn't happy with my look. I placed 25 out of 75 guys and was approached by Adam Silver of Silver Model Management. He set up my first photo shoot the day after competition and talked to me about coming to New York City. I didn't hear much after the shoot, so I wrote it off. Then I received a random phone call a few months later from Adam who asked if I could be in Washington, D.C., the next day because he might have booked Under Armour. I was extremely excited. He called later that day and confirmed that I was booked for the Under Armour catalog. I later appeared on the cover. After the Under Armour shoot, I gave fitness modeling a valiant effort and moved to New York City. I competed again at 210 pounds for the Universe Weekend show in Miami in 2009, and placed 9 out of 100. I was happy with my condition because it was the leanest I had ever been. After living in New York for a year, I got mixed up with the wrong crowd and partying became my priority. The fashion industry rules New York, so I decided to give that a shot for potentially more money. At the end of 2008, I quit lifting weights with the intent to get skinny. I did lots of cardio and my focus switched to joining a top 10 fashion modeling agency. Jason Kanner, who worked for Major Models at the time, signed me and I thought I was golden. That wasn't the case. My partying priorities kept up and I eventually developed an eating disorder. My plan of attack was to lose weight and get skinny by starving myself. I only ate a few tiny meals per day and smoked cigarettes to kill my appetite. Days of starving usually led to all-out binges. I ate large amounts of food then did what felt like endless cardio to compensate. I fell into a deep depression and the eating disorder continued for several months. That prompted me to leave New York and move to Nashville, where my life turned around. I went back to my roots and picked up the weights again. I can say that bodybuilding saved my life. Muscle memory is real. In April 2012, I got ill with pneumonia and was sick for the entire month. I had never been that sick, but it gave me plenty of time to think. I lost 15 pounds and my weight dropped to 200. I was determined to train hard when I became healthy to get my foot back in the fitness modeling door. I linked up with Tad Inoue when I recovered and he led my nutrition plan in May 2012. After working with him for several months, my body went to a new level. The past year has been mostly dedicated to the fit lifestyle. I did a shoot with Jason Ellis in November 2012 and the images are by far my favorite ever. I can't wait to compete in 2013 and see what the future holds. I love volume. My typical workouts are anywhere from 15-30 working sets. By using the muscle confusion training principle, I never do the same workout twice and it keeps the intensity high. Every workout consists of several intensity techniques like dropsets, partial reps, static holds, supersets, trisets, and giant sets. Rest time between sets is anywhere from 45-120 seconds. I'm a Champion Performance sponsored athlete. I'm highly driven to keep progressing. It's fascinating what the human body is capable of when you train, eat, and sleep properly. I'm never content with the way I look. It's a quality you must have to be a bodybuilder. This is my passion and it's what I love. I can't imagine my life without it. When I train, I'm in my own world. My friend Justin motivated me to get started when I was 18 years old. When I started experiencing the pumps, I was hooked. After a few years of training, I met my friend, Anthony. He took me under his wing and I learned from him. The discipline, dedication, and structure of the lifestyle motivate me to keep striving and improving. Bodybuilding is an art. As your body continues to evolve there is always something that can be better. I like to watch professional training videos. That usually does the trick. I read Muscular Development and Flex for inspiration and information. You can never learn too much. I'm going to compete in the NPC men's physique division in 2013 and my main goal is to obtain a pro card. I plan to continue living the lifestyle, training hard, and being an inspiration. Don't train with your ego. Focus on proper form and mastering the mind-muscle connection. Arnold and Frank Zane. I like their classic physiques. It's inspiring reading about their intensity, especially Arnold. I learned so much from studying Arnold and trying out different methods he believed in. Bodybuilding.com is the only place I buy supplements. BodySpace helped me reach one of my goals: to be an inspiration for people and give back the knowledge I learned during the past several years.